PGW is specialized in processing geophysical data, from DC/IP to gravity to magnetic data. 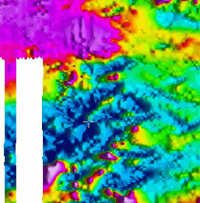 We utilize the most advanced geophysical software, and develop our own processing sequences based on a strong in-house geophysical background. We reprocess all potential field data, re-level data from airborne surveys and micro-level them through proprietary workflows. As leaders in processing, please also check our maps and projects documented in geophysical journals and by organizations (click here for a list). Processing drives data from raw feed to an end product through careful attention to detail. In the first instance, data processing suppresses noise, but also, it is essential for enhancing specific elements of the data, which is where PGW’s expertise, knowledge and software tools apply. Experience with literally hundreds of data sets and projects on the books, we know how to derive the most from the raw data either through processing or enhancing data and images – helping to achieve the highest resolution data possible and providing you with the key knowledge needed for project decision-making. And if you already have project data but want to return to the results and have a more detailed look, PGW can help. We routinely process data sets from a variety of sources – adding value and a new perspective on historic results and a fresh starting point for your project. PGW’s professionals are skilled in processing, yet there are tools that can help drive even more from the data. These include semi-automated techniques and software that we employ strategically for clients seeking to delineate contacts, lineaments, discrete sources (with depths) and of course, geologic targets. Methods include Source Edge Detection, Source-Parameter Imaging, Euler Deconvolution and Neural Network Targeting – a special algorithm from PGW sets the standard in Neural Network approaches and complements the other tools at PGW’s fingertips. PGW geophysicists are equipped with high-end computing and a full suite of software for its training, in-field QA/QC, processing and modelling. In the last 15 years, PGW has developed GXs for incorporation in Geosoft’s OASIS montaj™ that provide specialized capabilities for levelling, microlevelling, height correction, contact location, source parameter modelling for magnetic data and neural network classification. In 2013, PGW became representative of pb-Encom for the Americas for its geophysical packages ModelVision, PA Discover and EM Flow. Since 2014, PGW is also representing Intrepid Geophysics (Intrepid and 3D Geomodeller). PGW provides specialized technical support for all these high-level data modelling and interpretation packages. 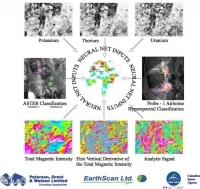 Paterson, Grant and Watson Limited and EarthScan Ltd. have developed new methodology for ore deposit targeting, under a two-year project sponsored by the Canadian Space Agency. 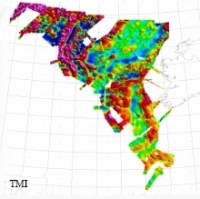 PGW and Tau Geophysical Consultants are working together to provide exploration companies with the best services in EM data processing and interpretation. 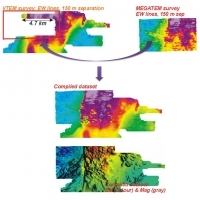 Similar to gravity, magnetic survey results are affected by topography. Measurements are taken on rugged planes instead of flat surfaces. In addition, for airborne magnetic surveys, varying terrain clearance (ground-receiver distance) is also introduced by topography. It is necessary to remove topographic effects in order to reveal true signals from subsurface geological targets. Corrugations are present in airborne surveys due line-to-line elevation variations. PGW uses its own processing sequence for microlevelling to remove corrugations from the data, and at the same time retain both large and small features.